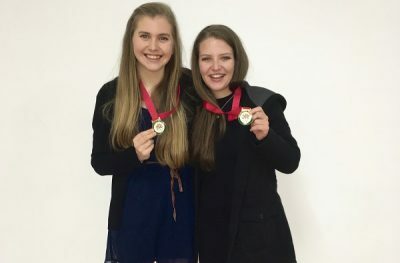 NMU-Madibaz squash players Hayley Ward and Bianca Brown kept the varsity flag flying high at the University Sport South Africa tournament in Johannesburg this month, both being selected for the Top Six at the conclusion of the event. Competing in the individual event, the 19-year-old Ward, a second-year accounting student, finished fourth, followed by the 21-year-old Brown in fifth spot. In the team competition, which combined the men’s and women’s sections, Madibaz ended fourth overall. Both players said the tournament had provided tough competition, but were delighted with their performances. Ward, a former Collegiate pupil, said the final outcome was a boost for her confidence. “I am so happy I was able to accomplish this because it shows that all the hard work has paid off,” she said. She added that the highlights of the week were receiving the most improved player award and being named at number one in the Best of the Rest team. This side is named at the end of the tournament and does not include members of the winning university. She paid tribute to her mother, Gail Millard, for her constant support and advice, while also acknowledging the contribution of her coach, Greg La Mude. Brown, who was educated at Hudson Park in East London, said she felt she played some of her best squash at the USSA tournament, having narrowly missed out on Top Six selection last year. “It was reward for the hard work I have put in, even though I found the tournament very tough,” said the third-year law student, whose matches all went to five games. After losing in the quarterfinals to eventual champion Alexa Pienaar of UJ, she won her remaining matches in the 5-8 playoffs to end fifth. She said she had gained confidence in her playing ability from the week. Brown also alluded to the importance of the team event as she reflected on some of the highlights. Looking ahead she said she would be aiming to make the USSA side for the International University Sports Federation Games next year. “If my studies allow, that will be my big goal for 2018,” she said. Madibaz Sport squash manager Melissa Awu said they were proud of the two players’ achievements, as well as the performance of the team. “It was indeed a competitive tournament and great to watch.